Today I am up with a totally different post that I usually do lipstick reviews only … yes ! 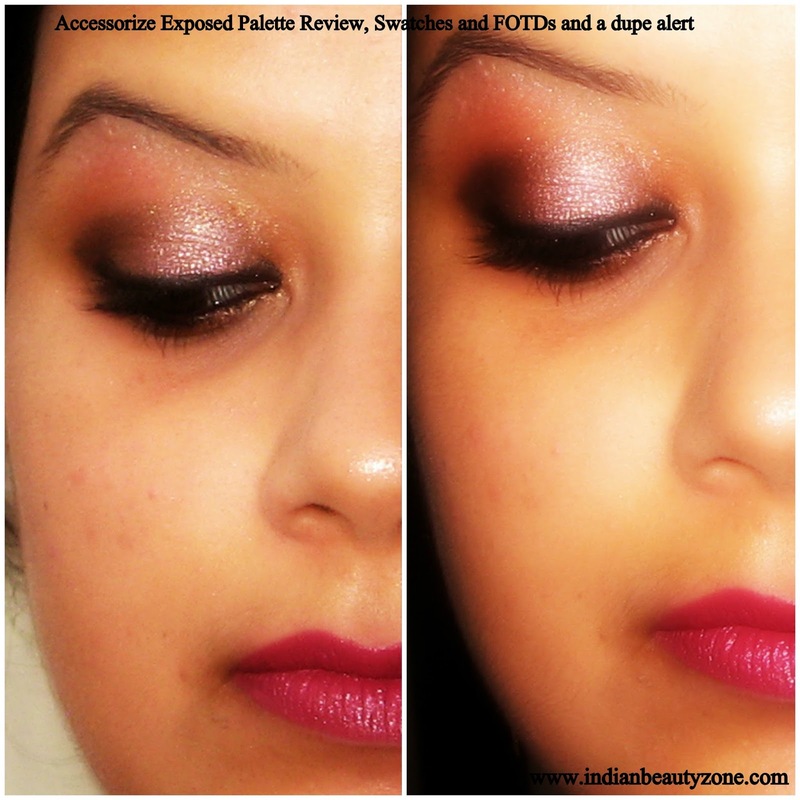 I guess the tittle said everything…today I am going to review Accessorize Exposed Palette that I recently brought from Jabong.com. I always love eye makeups, apart from lipsticks, my first love like everybody know is my lipsticks and my second love is for eye shadows. I love collecting palettes and single eye shadows. “Accessorize gives you a chance to look glamorous every day, courtesy this ‘Exposed’ eye palette. 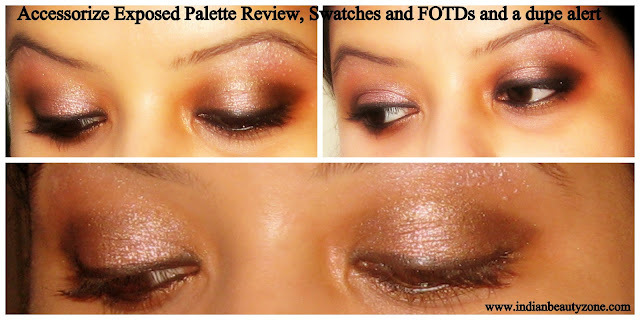 Including eye shadows in various shades, it will help you sport a new look for different occasions. Here is the picture of the list of ingredients in it. Accessorize exposed palette basically an eye shadow palette that consists of all shades based on neutrals that you can use for your everyday look. The packaging of the palette is very cute, as you can see there is a small mirror inside the palette which is very helpful in case you need touch up. Next coming to the packaging the palette is based on a hard cardboard which has magnet I guess that hold the lid of the palette firmly still for additional security there is an elastic band that hold the lid of the palette firmly and gives a lovely look too . 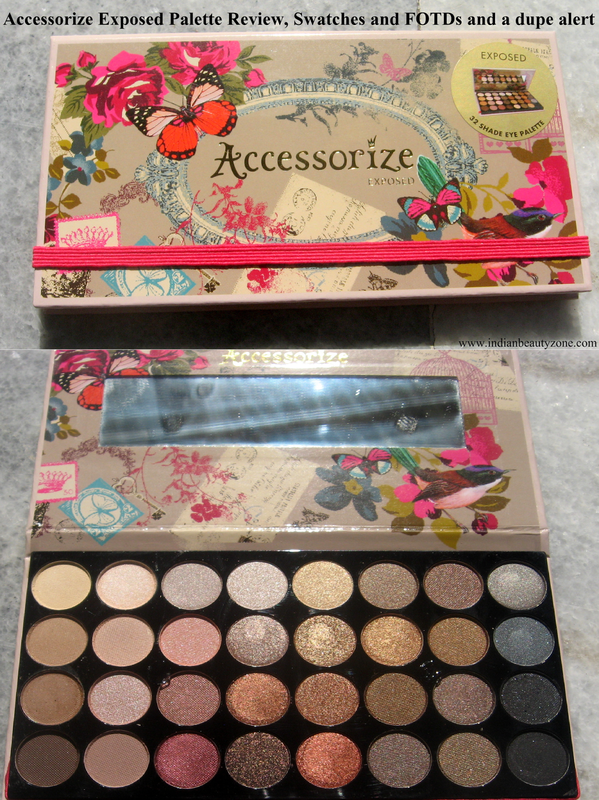 I never knew that accessorize do have such lovely palettes [ I know I am kind of Dumbo when it’s comes about internet surfing] , it was my friends Renu and Renji [the two beauties from blogging world ] shared their shopping experience of this palette on Facebook from where I get to know and grab this palette without second thought just seeing the lovely packaging. the shades that are true wearable for everyday look. It consists of both matte and shimmery finish eye shadows. The shades from upper two rows are from Neutrals and are highly shimmery as you can see from the swatches of the shades in my hands. I marked the shades in numbers that I used to do the eye makeup. 1. As base of the eye shadows. 2. On the middle part of the upper eye lid. 3. Near the tear duct and on upper eye lid of inner side of the eye. Followed by blend, blend, and blend with a blending brush. And here is the picture of the entire makeup stuffs that I use for this makeup. But forgot to put the picture of the mascara that is lakme eye conic mascara and the lipstick I use is Mac Captive. Now coming to the pros and cons of the palette! 1. Nice packaging, customer attractive. 2. Sturdy cardboard case that gives the palette a vintage look. 3. The shades are pretty wearable on daily basis. 4. The shadows are pigmented. 5. Stays near about 6 hours on my eye lids intact. 7. Texture of the shadows are soft thus easy to blend. 2. Pricey if it not brought in offer. My ratings:-4/5 due to the cons. My recommendation: - if you love neutrals then this palette is definitely going to be “must have” in your kitty. As the availability is an issue so I can show you a dupe of it. Here is the picture showing the shades of Mua palettes from “heaven and earth” and “undress me “along with the “accessorize exposed palette”. Have a close look, this particular palette from Accessorize is actually a dupe of Mua heaven and earth and undress me palette so if you can’t get Accessorize one then you can grab the other two palettes from Mua. Hope you all like my review! Thank you sweetie :) m overwhelmed ! All the shades in the Palette looks cool! well I am gonna grab when re-stocked!! Thanks for the mention :D I love this palette and I've used it pretty much every time after buying it! the shades are so pretty..they appear to be very creamy and pigmented.. Yes riiti the shades are mearly baked like eye shadows so soft and pigmented.. This is just stunning. Loved all the colors..